Read On! » Blog Archive » Some Writer! Some Book! 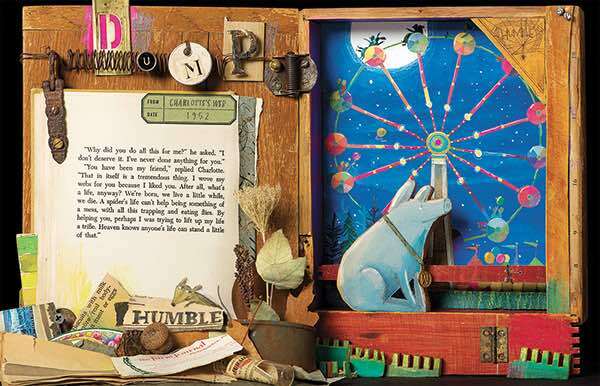 If I were on one of the Association for Library Service to Children (ALSC) children’s book awards committees, I would give the Newbery Medal and the Robert F. Sibert Medal to Melissa Sweet for her book, Some Writer! : The Story of E. B. White (HMH Books for Young Readers). I’ll be writing about the 2017 winners of ALSC awards after they are announced on Monday, January 23 at the American Library Association mid-winter conference. I have to admit that I am a die-hard fan of Melissa Sweet’s work. She has illustrated a number of picture book biographies that I share with our students. Before Some Writer! was published, I would have a difficult time choosing a favorite among those that she has illustrated or illustrated and written. Just before Thanksgiving, I always share Balloons Over Broadway: The True Story of the Puppeteer of Macy’s Parade (See my entry on this book) which is the story of Tony Sarg and his creations during the first Macy’s Parade. Sweet’s collaboration with Jennifer Bryant produced other favorites, A Splash of Red: The Life and Art of Horace Pippin, The Right Word: Roget and His Thesaurus and A River of Words: The Story of William Carlos Williams. Melissa’s collaboration with other authors contributed equally fine books. Then came Some Writer! Where do I begin? 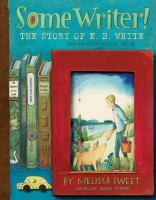 It will be no surprise that I’m a fan of E. B. White’s work, and I refuse to pick a favorite among his books for children. His talent extended far beyond that as he wrote for The New Yorker and co-authored The Elements of Style. Melissa Sweet brings E. B. White to life for readers. Her colorful and captivating collage illustrations complement her research on E. B. White. Both White and Sweet are masters of their crafts. I can’t recommend Some Writer! more highly. Thanks so much. I just bought the book! I wasn’t able to type in my blog address for some reason. I hope that you will enjoy it as much as I have.